Everyone here can look up all the â€œFlight 93â€� pictures you want and find many pictures of the empty hole in the ground. Even the tiny little 20-foot diameter hole shows grass growing on all the slopes. Notice the vegetation and grass which has overgrown the crash imprint already! 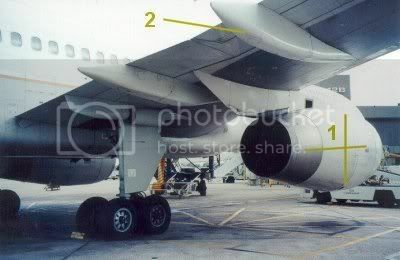 This is what most might assume are the wingtips and the tail fin imprinted onto the ground. Yet they are completely over-grown with grass! And grass and vegetation is also seen growing on the sides of the burning pit walls! This must be some kind of new Sunni Muslim Prairie Grass, which is able to grow back in minutes! 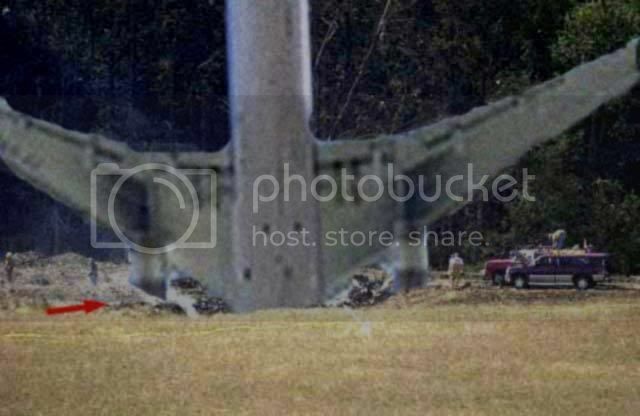 This shows that a large portion of the imprint of what we were told was Flight 93, was made long before 911! And that the owner of this property is a key witness, and a probable player into what really happened on 911! 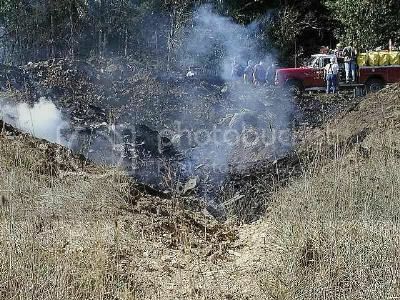 This crash site was pre-made, and shows no wreckage, nor burning jet fuel. Two staples of every airplane crash before 911! The owner of this property is one of the players in 911! The photographer appears to be crouching down in the hole, but our eye level is still on the same plane as the hood on that fire truck. Some people actually believe this little hole is 35 feet deep :0), when you can see the hole cannot possibly be more than just four feet deep. Any engines or black boxes the government claims were found here would be planted 'after' this grass was later removed. This link and Fox News Report tell the story. Go to the What Really Happened Website and verify all the evidence for yourself against the documented pictures here to realize MANY people have been DUPED by Senor Bushie from the very beginning. 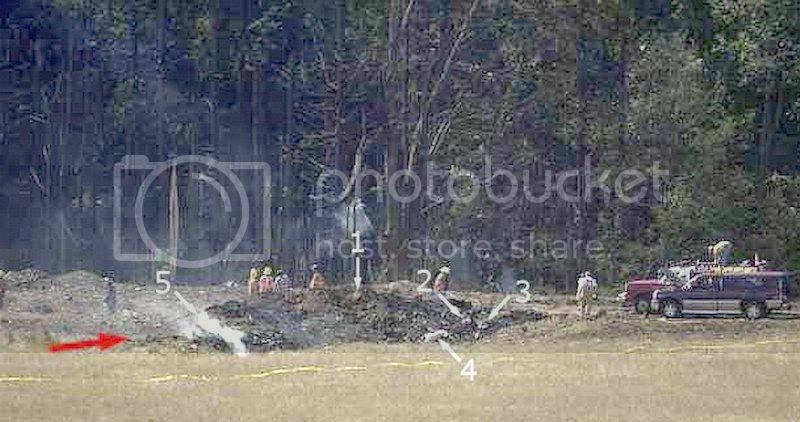 What we need is some hard evidence for WHY some Americans continue to believe Flight 93 crashed into this empty field outside Shanksville, Pennsylvania, besides â€œBecause Senor Bushie told me so . . .â€�. Hmm, good stuff Terral, I'd never noticed the intact grass before, good observation. It is glaringly obvious to any person with two functioning eyeballs that no plane crashed at this site. What seems to be a great inconsistency here, or at least the first thing that struck me, was that in the news video posted above, they state that the FBI were treating it as a crime scene, and closed the place off, erected tents etc, now why did they not treat the WTC in exactly the same fashion? Where has the UAL flight 93 aircraft ended up you think? UAL must have reclaimed the aircraft logically speaking. Was it hijacked by extra-terrestrials and taken to some other galaxy? Who cares? :0) The Govâ€™t is LYING about all of these related 911Truth cases and have been from the very beginning. Why ask why when you are dealing with a bunch of lying Inside-Job bad guys guilty of murdering innocent Americans and running the cover up operation for all these years? Your Congressmen and Senators already know 9/11 was an Inside-Job and they do nothing about it. 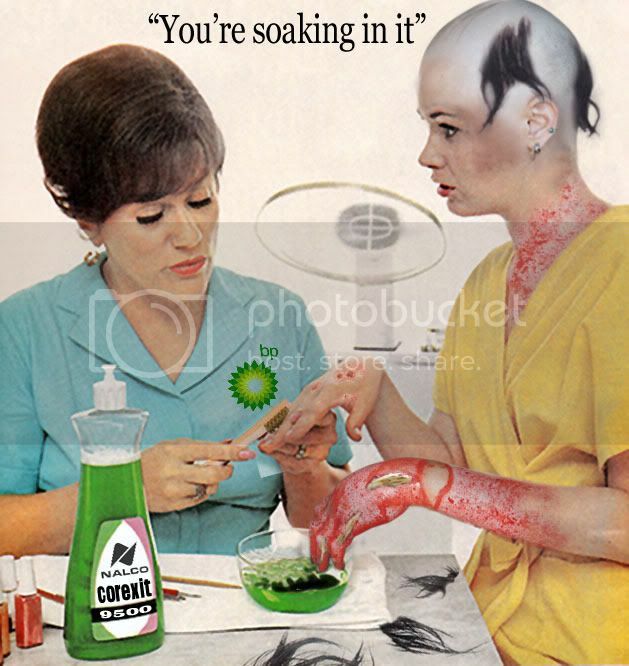 The USA has been run by a bunch of lying murderers for the last eight years and We The People have been DUPED all this time and will continue sitting in the pot, like the happy frog, about to come to a hearty boil. The USA will be transformed into CanAmeriMexico to become part of the New World Order, because that is exactly what the dimwit Americans deserve. The Bushie FBI has never turned over even one â€˜time changeâ€™ part (story) to prove possession of ANY 9/11 Jetliner and they never will. They sit back and watch 10,000 families go into foreclosure every day (story), while Bushâ€™s Illegal Alien Foreign Nationals run around loose EVERYWHERE. Why? Because this is the CanAmeriMexico fascist state that the people deserve . . .
1. 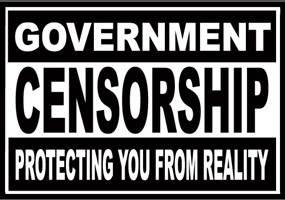 It never existed in the real world only on a government press release. 2. The real flight 93 was swapped with a another flight number and the passengers (a number of whom were Government employees) were "encouraged" to secrecy. 3. The plane was shot down by a USAF fighter pilot who disregarded stand down orders and the Shanksville crash site is where the largest piece(s) fell. 4. 93 was a remote control drone, it malfunctioned and was destroyed (self destructed) intentionally before it could crash leaving copious evidence. 5. The plane actually did crash dived into the field buried itself into the ground and totally disintegrated from the intense heat which did not burn the nearby grass. Even looking at the footage during the time, I never believed a plane crashed there, there was just no evidence of it, just like at the pentagon, no evidence there either!! Also, wasn't there another member here, who showed that flight 93 had been grounded or something. I'm not sure where that would be now!! 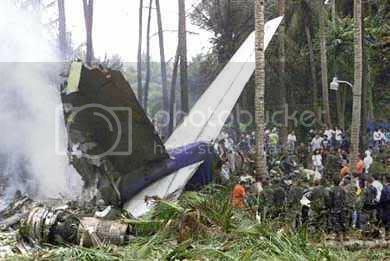 I have always been curious as to what happened to all the civilian passengers if the plane wasn't actually shot down? I have always been of the camp that thinks it was shot down by mistake by our military. Couldn't agree more, it was a rhetorical question and I should have stated that, I was going to in the post above but just figured folks would pick up on that. I was using it as yet another inconsistency in the BS story, it's just another hole that they forgot to cover, excuse the pun. Where has the UAL flight 93 aircraft ended up you think? UAL must have reclaimed the aircraft logically speaking. He is an Inside-Job bad guy just like the others. And you think the fact that Obama was born in Kenya means something? We are talking about people willing to murder innocent Americans and those willing to run cover-up operations to boot. They know Americans will believe just about anything no matter how ridiculous and contrived the â€˜Official Storyâ€™ might be. Americans should feel stupid for falling for such trickery, but they keep flipping the channel to be entertained without blinking one eye. And do you know the reason why? Because they really are that stupid . . . The murderer in the White House told them a 100-Ton Jetliner crashed in that empty Shanksville field and that is good enough for the subjects of CanAmeriMexico . . .
No problem at all. :0) I appreciate you bumping this thread, so perhaps more PP members will wake up to â€˜the truthâ€™ that 9/11 was definitely an Inside Job. 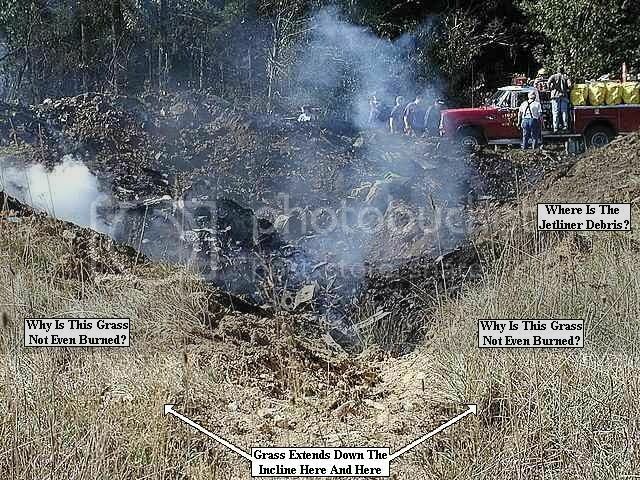 I apologize for being so blunt, but this Flight 93 case stands out in my mind as the ultimate smoking gun; because we are obviously looking at a little tiny empty hole (pic) that does not even remotely resemble any real Jetliner crash. 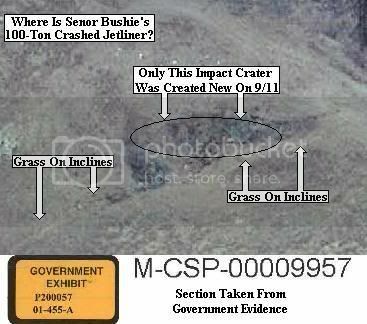 Even without the Pentagon Case and without the WTC cases, then this Shanksville case all alone shows the arrogance of the Bushie Administration trying to push a Cover Story that is not even close to matching the real evidence. If you are going to stand there and lie directly into my face, then at least have enough common courtesy to tell me something that is close to believable. Bush and Rove and Cheney and Rumsfeld and all of their cohorts should have been arrested and executed for even trying to sell us this pile of BULL related only to this Shanksville case without even beginning to address the other facets of 9/11. Even the casual reader to this thread should be concerned that our elected politicians have allowed this charade to continue for all these years. This single story right here speaks to the extreme magnitude of corruption that is present in all levels of our Federal, State and Local governments where everyone involved is looking the other way and allowing murderers to run the show. Now when the entire Economic System of our Western Way of Life crumbles right before our eyes, then we must accept the fact that this is what we really deserve. We have had all these years to do the right thing and put Bush and Cheney behind bars, but chose to look the other way like everybody else. Right? All good - it needed doing. In my view this is the most important section of the entire forum, as it's (I'll presume) 99.9% of the reason that most of us are here, 9/11 was the catalyst that spurred us on to become infowarriors / truthers or whatever superficial label anybody chooses to attach, if we uproot 9/11, we uproot a hell of a lot of other problems and issues that people are suffering for, have died for, and will continue to die for. I'm no 9/11 whizz, have not done as much research as some and haven't wirtten thesis papers on 9/11 but maybe someday I will, 9/11 was an inside job unquestionably. We haven't seen one shred of credible evidence from the neo con artists that suggests otherwise and until we do there'll be no convincing this guy that anything other than an inside job is the case! Anyway, back to Flight 93! All good - it needed doing. In my view this is the most important section of the entire forum, as it's (I'll presume) 99.9% of the reason that most of us are here, 9/11 was the catalyst that spurred us on to become infowarriors / truthers or whatever superficial label anybody chooses to attach, if we uproot 9/11, we uproot a hell of a lot of other problems and issues that people are suffering for, have died for, and will continue to die for. A man of real 911Truth conviction! I like that. :0) I also believe this 9/11 Forum is among the most important, but second to the Bible Thumping Forum (Two Gospels and Two Churches Opening Posts) where we debate/discuss the truth of Godâ€™s Living Word. 2Tim. 2:15. After all, what does it profit a man if he knows all things perfectly about â€˜theâ€™ 911Truth if he â€œforfeits his soul?â€� Matt. 16:26? :0) This Flight 93 Shanksville case is a testament to the fact that the â€œMystery of Iniquity/Lawlessnessâ€� (2Thes. 2:7-12) has application to FAR MORE than simply â€˜the truthâ€™ of Godâ€™s Living Word, as people all over the world are 'blinded' by the â€˜deluding influenceâ€™ and forced to â€˜believe what is falseâ€™ (2Thes 2:11); believing in their heart of hearts that 100-Ton Jetliners crashed where that NEVER HAPPENED. 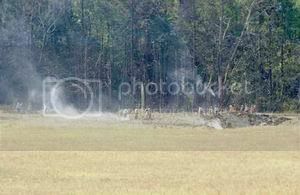 Nobody here has ever seen one picture of Flight 93 crashed ANYWHERE, as all of these pictures (link = study them all) show nothing more than 'empty hole' in AN EMPTY FIELD. And that does not include the cargo and bodies that are obviously NOT present in any of these photographs. If you go back and revisit the first picture above (picture #1), then you can see most of the workers have their backs turned to the little hole, because obviously there is no 100-Ton Jetliner crashed there. :0) Note the yellow tape laid down behind the supervisor and very near the empty hole, because that separated the supposed impact zone from the area where no debris is found. The two hands folded behind his back tell the whole story that NOTHING like any real 100-Ton Jetliner crashed here. I'm no 9/11 whizz, have not done as much research as some and haven't written thesis papers on 9/11 but maybe someday I will, 9/11 was an inside job unquestionably. We haven't seen one shred of credible evidence from the neo con artists that suggests otherwise and until we do there'll be no convincing this guy that anything other than an inside job is the case! Navy Prosecutor In Gitmo Case says flight 93 "shot down"
infowars.net â€” Though the trial the man, dubbed "Osama bin Laden's driver", is primarily functioning as a show piece for the Bush administration's "war on terror", some interesting information emerged from the Guantanamo Bay naval base yesterday in the form of a direct admission from a US prosecutor that the fourth plane was "shot down". You see the pictures of the wreckage tonight for the FedEx plane in Tokyo? There is a whole plane! Compare that to the wreckage in Shanksville!!!? Are you kidding me? Okay, the plane in Tokyo didn't come straight down, it still turned into a giant fireball. I thought these planes were supposed to disintegrate from the jet fuel? I see a whole plane in Tokyo!!! So were there ever reports of bodies being found at the site? The 1/3 of plane was smashed into microscopic pieces (except for the black box), the other 2/3 buried itself "deep" into the ground. Hell I'm convinced! Now if I could only get some kerosene and office furniture to melt a steel support beam I'd get the Popular Mechanics Man of the Year Award. A southeasterly wind and a 3-year-old’s keen eye brought the crash of United Airlines Flight 93 home to a family in tiny New Baltimore borough, more than eight miles from the Somerset County crash site. When Andy Stoe glanced at the paper, ready to toss it in the trash, he saw it was a charred payroll check made out to Antonio B. Costa of San Jose, Calif.
Investigators now concede the canceled check and a portion of a charred brokerage statement Stoe found nearby on Thursday afternoon are from the crash. Costa, a 59-year-old construction worker, was not a passenger on Flight 93. Stoe said authorities initially insisted crash debris could not have traveled over a mountain ridge more than eight miles from the crash. Late yesterday afternoon, however, FBI Special Agent Bill Crowley said experts from the National Transportation Safety Board had checked weather reports and determined that lightweight materials might well have traveled over the mountain by a southwest wind that reached a speed of 9 knots. “The NTSB says it is not only plausible, but probable,” said Crowley. About two miles from the crash site, Ron Trent, a 63-year-old third-generation farmer, never imagined anything like it could happen so close to his home. He was stunned when agents asked him to postpone cutting his hay until they can search the field. Looking over his farm’s rolling hills, Trent shoved his cap back on his head and scratched his chin. “I believe this country is in a bad situation, the situation this country is in right now, and I don’t think it’s going to get any better. “That sure is pretty. I’m sure glad I grew up here. I guess it (the crash) really put Shanksville on the map,” he said. Farther down the road, searchers had tied flags in one of David Scott’s cornfields to mark areas they wanted to search more closely. “It’s just too bad we couldn’t be on the map for something other than disaster,” said Scott, chatting with neighbors William Flamm and Meno Yoder, as a state police helicopter circled low over his fields. Investigators also descended on nearby Indian Lake. The resort community two miles from the crash also became part of the official search area after small pieces of crash debris were recovered from the 750-acre lake. John Fleegle, an Indian Lake Marina employee, said FBI agents were skeptical of his reports about debris in the lake until they traveled to the lake shore Wednesday afternoon. Fleegle, marina owner Jim Brant and two of Brant’s employees were among the dozens who witnessed the crash from Indian Lake. Fleegle had just returned to the marina to get fuel for a boat that had run out of gas when Carol Delasko called him into the drydock barn to watch news of the World Trade Center attack. “All of a sudden the lights flickered and we joked that maybe they were coming for us. Then we heard engines screaming close overhead. The building shook. We ran out, heard the explosion and saw a fireball mushroom,” said Fleegle, pointing to a clearing on a ridge at the far end of the lake. Delasko, who ran outside moments later, said she thought someone had blown up a boat on the lake. “It just looked like confetti raining down all over the air above the lake,” she said. Fleegle said he climbed on the roof of an abandoned cabin and tossed down a burning seat cushion that had landed there. By Wednesday morning, crash debris began washing ashore at the marina. Fleegle said there was something that looked like a rib bone amid pieces of seats, small chunks of melted plastic and checks. He said FBI agents who spent the afternoon patrolling the lake in rented boats eventually carted away a large garbage bag full of debris. Kate Moses, a former Pittsburgh woman whose retirement home is located near the Indian Lake golf course far from the lake, said she felt the impact from the crash and went to look outside. Later, her neighbor found a brokerage statement for a $2 million stock account had landed in her yard. “How could that have happened? It’s just a horrifying thought. I’ll never be the same. I know that,” said Moses. A confirmed Broadway buff who loves New York, Moses said the terrorist attacks on the World Trade Center and the hijacking that ended near her Somerset County home have made her hesitant to even consider traveling to New York anytime soon. Back in New Baltimore, Andy Stoe is keeping track of everything so he can explain it all to Hunter when the toddler gets a little older. And he holds the peace of his tiny valley town more precious than ever. “It could have crashed here just as easy as anywhere. Thank God they put it down somewhere unpopulated,” said Stoe, as Hunter pushed a toy bulldozer through his sandbox. That was a huge mistake: The plane vaporized, but the personal effects of this woman, survived the crash unscathed? You conveniently forgot the phone message her husband got from her cell phone when in 2001 you couldn't place cell calls on flights where she was not going to see him again etc. then the woman whispering to CeeCee "you did great" at 37 second mark. So you mean to tell me her person was utterly destroyed, but her personal effects made it. And that the plane disintegrated? Military planes sometimes “shadow” airliners that are in trouble or have lost radio communications, as part of efforts to re-establish contact. An Air Force spokeswoman at North American Aerospace Defense Command in Colorado, Capt. 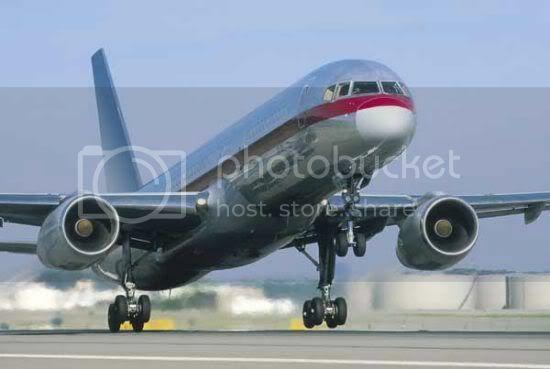 Adriane Craig, said the military could neither confirm nor deny whether an airplane was following the United 757. “NORAD-allocated forces have not engaged with weapons any aircraft, including Flight 93,” the statement said. “It’s not a very palatable piece of news for the American public,” said Victor Ujimoro, a professor of aviation management at the University of Western Ontario. Crowley said the recorders from Flight 93 did not send out any emissions. 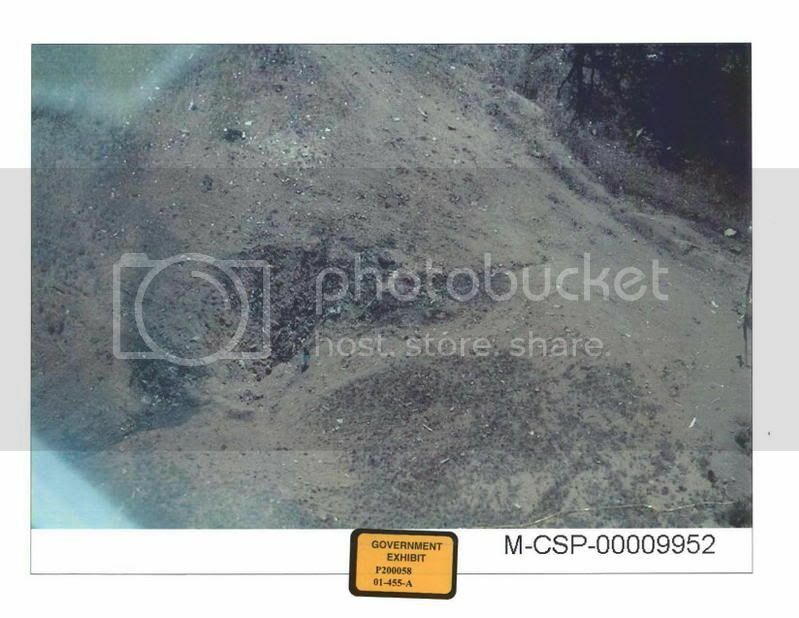 It was discovered by an “integrated search team” of state police and federal investigators using heavy equipment to unearth the device from the crater cut into the ground on impact. A passenger, Mark Bingham, ['Hi, Mom, this is Mark Bingham!' ] 31, of San Francisco, Calif., was able to call Westmoreland County 911 and tell a communications officer that the plane had been hijacked and the terrorists had a bomb. There was a sound of an explosion before 911 lost contact with Bingham. An evidence collection team comprising technicians from several different federal law enforcement agencies has been working since Tuesday, collecting parts of the airplane and human remains, as well as searching for the recorders. “If you were to go down there, you wouldn’t know that was a plane crash,” he continued. “You would look around and say, ‘I wonder what happened here?’ The first impression looking around you wouldn’t say, ‘Oh, looks like a plane crash. The debris is very, very small. Tribune-Review staff writer Jason Togyer and The Associated Press contributed to this story. "Light debris was also found eight miles away in New Baltimore. 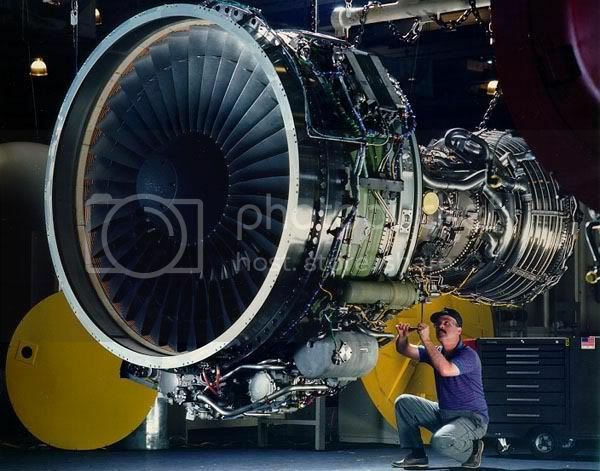 A section of engine weighing a ton was located 2,000 yards - over a mile -from the crash site." I know, everything was NIST and towing the government lies. Did you see what it posted in the 2nd Amendment board? pjcz, only that's because Sane had to take out the trash. Thanks Sane, Agent 99 was starting to annoy me. OMG!!!! I just reread what I wrote. I am so sorry that came out all wrong!! I was not referring to you as trash. I was referring to nilly. You had quoted nilly then responded. Sane took out all of nilly's and so yours was wiped with it. I am sorry for not making that clear. He edited my post. 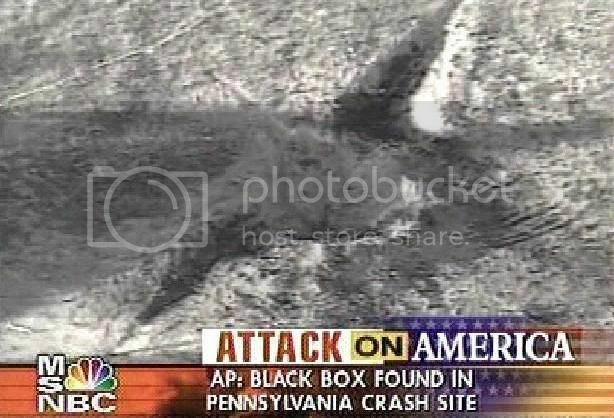 Dude, that looks like they took that picture in Centralia, PA not Shanksville, PA!! What's up with that? Yet it did, yet there were witnesses, yet there were parts of a plane recovered from that site, yet there were body parts recovered from that site!!! Sure, the movie Loose Change states that Flight 93 never crashed in that field yet that doesn't make it true!! Harris was on his way to the airport when he learned a plane had hit one of the World Trade Center towers. He did not turn around and he did not call his loved ones. Instead, he headed straight for Oâ€™Hare International Airport. â€œUnited  was over Ohio and headed toward Chicago,â€� he said. Harris was in touch with Mayor Daley's office informing the staff that the plane was still headed toward Illinois. With the flight out of contact with the FAA, it was assumed to have been hijacked, he said. The Sears Tower and the central Loop business district were ordered to be evacuated. Marr told Commission staff that his focus was on UAL 93, which was circling over Chicago. Marr thought VAL 93 was waiting for word over what had been happening across the country to begin its attack. What do you mean "who cares"? Who cares about the truth? That's like telling the victims' families, "Who cares about what really happened to your loved ones and who caused it." Everyone deserves to know the truth about one of the most horrifying, tragic events in American history that took the lives of many and changed the landscape of our society. It sounds like you're just interested in getting revenge and foaming at the mouth waiting for the government to be taken down. That's just inane and immature and it makes you no better than them. The fact that you refer to them as "bad guys" pretty much says it all. Stop playing video games and have a little faith in humanity to expose the truth and right this terrible wrong. We only deserve this corrupt, violent society because of attitudes like yours.